A gifted Clairvoyant, Razzi has been doing readings and energy healing for more than 46 years. Her passion and soul's purpose is in being a light worker and being a channel for your healing and the healing of the world. Her higher purpose is to bring positive, life-changing clarity to assist you in finding the balance and success you strive for each day. Razzi feels that women supporting women is critical to the well-being and nurturing of our homes and families. Clairsentient, Clairaudient, Clairvoyant, Claircognizant, Empath, Mediumship, Medical Intuitive, Spirit Guides and Angels, Tarot Cards, Runes, Pendulum, Medicine Cards and Crystals. Career, Financial, Legal, Family, Spiritual, Past Life and Past Life Regression, Mediumship, Distance Energy Healing, Dream Analysis, Spirit Guides, Shamanistic Rituals, Ordained Reverend, Sound Healing, Reiki, EFT/TFT. Certified Reiki Master in 12 different systems, Licensed Massage Therapist for 15 years, Bachelors in Music Performance and Composition, Certified Vibration Therapy Healer, Crystal and Mineral Healing Therapist, Bodywork Counseling, Ordained Reverend, Published Inspirational Author, & Shamanic Healing & Rituals. Razzi works with Guides and Angels to bring you messages of hope and healing. it is not enough to know what healing is to your best and highest good, but how you will get there. You and Razzi will work together to establish practical and manageable steps to reach these goals. She can intuit, via the Divine and the energy of where you are headed. This way you can by pass some of the challenges and hardships. Should you be in the middle of a hardship or crisis, there is often a lesson that you are learning. Razzi is honored to help you discover the lessons so that you can move through it with Wisdom, Grace, and Discernment. Psychics and Intuitives do not provide "time frames" as each of us has free will. Much like math, science, and physics, if you change one small component you have a different equation and outcome. There are times in a reading where Spirit has refused to give a timeline as it takes the focus away from your healing journey. Much like saying, " are we there yet?" as a child in the back seat of your families' car, you miss the incredible journey that Spirit and the Divine have offered you! There are times when she will get a message for immediate actions that need to be taken on your part to heal a situation before it escalates. Razzi delivers your messages verbatim to ensure that any phrases or iconography that you might have asked for prior to the reading come through for you. Not all the messages will be what you want to hear, but will serve your best and highest good. 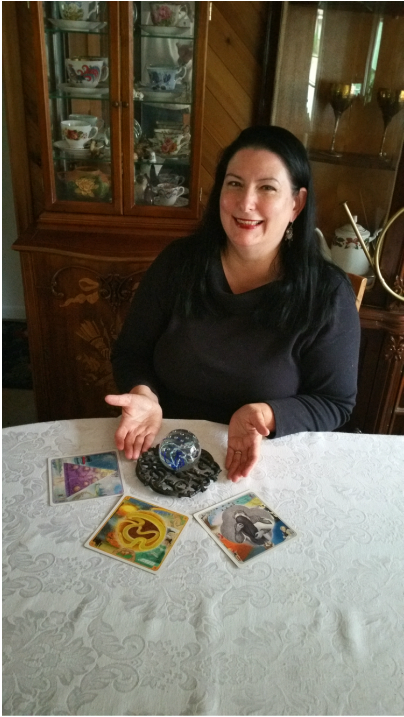 Razzi is happy to work with Tarot, Runes, Crystals, and Pendulum during your reading at your request.